Views from the F.A.A.E. 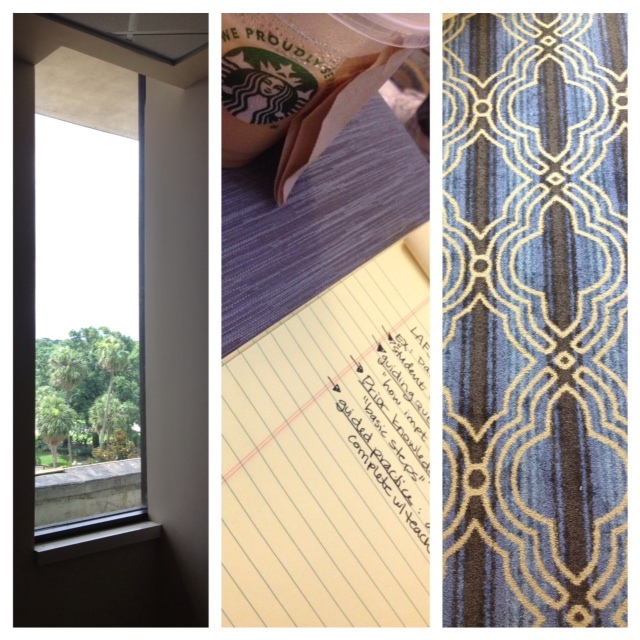 Conference: window, notes and rocket fuel, awesome rug. This is what I was promised during a recent session at the Florida Alliance for Arts Education Leadership Summit. Was this tailor-made for me? I’m constantly running around – switching materials in the two minutes between classes, creating power points, emailing parents, entering grades – before I collapse on the couch at home with the nagging feeling I’ve forgotten something. During the three-day conference, this presentation, given by Eric Smith, was the most useful break out session I attended. So, what is the secret to being an organized person with time for your own art? Whether it’s an electronic calendar or good old-fashioned paper planner – don’t write it down if you’re not actually going to do it. Two email inboxes: work and home. Two physical inboxes: work and home. One mobile inbox – the iPhone has specific apps for this. Each Friday, Smith suggests asking yourself if you’ve gotten everything done, what’s still nagging you and if you can clear out anything remaining in your inboxes? A Friday calendar review can help you plan. What are you going to do over the next two weeks? What are you going to do over the next two months? Ahhhh, the elusive 8 hours of sleep. It’s important! I haven’t mastered this yet. I’ll let you know how these habits work for me – I make no promises about the sleeping part.